I've brought the Preferences Viewer into its natural habitat now. I think a toolbar will span across the top of that list (right under the "General Preferences" heading) with sensible icons for each type of constraint. Quick, somebody tell me what a "Credits betweeen __ and __" icon looks like! I want to edit the "Courses to Include" viewer too. Right now, for example, you can see it listing "BSAD-120 (A), BSAD-120 (B), ..." as the first item, when really all I requested was "BSAD-120" (meaning any section of it would be fine). 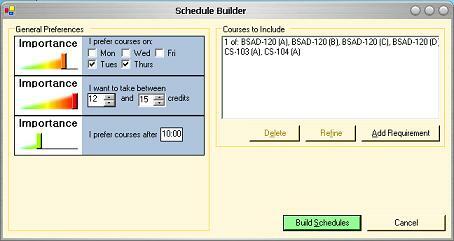 That list should clearly show which courses and sections are required, using indentation to mark off alternatives.